North Carolina State University researchers have developed an effective and environmentally benign method to combat bacteria by engineering nanoscale particles that add the antimicrobial potency of silver to a core of lignin, a ubiquitous substance found in all plant cells. The findings introduce ideas for better, greener and safer nanotechnology and could lead to enhanced efficiency of antimicrobial products used in agriculture and personal care. In a study being published in Nature Nanotechnology July 13, NC State engineer Orlin Velev and colleagues show that silver-ion infused lignin nanoparticles, which are coated with a charged polymer layer that helps them adhere to the target microbes, effectively kill a broad swath of bacteria, including E. coli and other harmful microorganisms. As the nanoparticles wipe out the targeted bacteria, they become depleted of silver. The remaining particles degrade easily after disposal because of their biocompatible lignin core, limiting the risk to the environment. "People have been interested in using silver nanoparticles for antimicrobial purposes, but there are lingering concerns about their environmental impact due to the long-term effects of the used metal nanoparticles released in the environment," said Velev, INVISTA Professor of Chemical and Biomolecular Engineering at NC State and the paper's corresponding author. "We show here an inexpensive and environmentally responsible method to make effective antimicrobials with biomaterial cores." 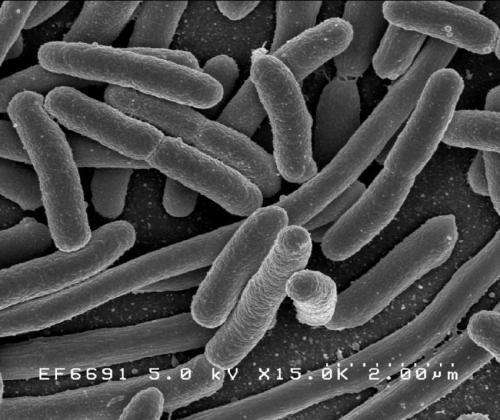 The researchers used the nanoparticles to attack E. coli, a bacterium that causes food poisoning; Pseudomonas aeruginosa, a common disease-causing bacterium; Ralstonia, a genus of bacteria containing numerous soil-borne pathogen species; and Staphylococcus epidermis, a bacterium that can cause harmful biofilms on plastics - like catheters - in the human body. The nanoparticles were effective against all the bacteria. The method allows researchers the flexibility to change the nanoparticle recipe in order to target specific microbes. Alexander Richter, the paper's first author and an NC State Ph.D. candidate who won a 2015 Lemelson-MIT prize, says that the particles could be the basis for reduced risk pesticide products with reduced cost and minimized environmental impact. "We expect this method to have a broad impact," Richter said. "We may include less of the antimicrobial ingredient without losing effectiveness while at the same time using an inexpensive technique that has a lower environmental burden. We are now working to scale up the process to synthesize the particles under continuous flow conditions." Does Agion silver technology work as an antimicrobial?